Frozen: Not for the faint-hearted. 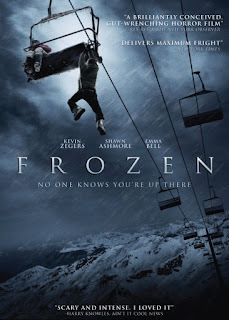 Frozen tells the story of three friends, Parker O’Neil (played by Emma Bell), Joe Lynch (played by Shawn Ashmore) and Dan Walker (played by Kevin Zegers), who get stranded up a ski lift and forgotten about after a ski centre closes for the weekend. The only choices available to them are therefore to either stay put and wait until they freeze to death or pursue some more extreme courses of action in an attempt to survive. It’s a simple idea, but also a frightening scenario and one which therefore provides ideal material for a suspense movie. Given that this is a movie with a story which can be summarised in one sentence, you might think there’s not a lot of potential for plot development but in actual fact once the predicament begins, Frozen features almost constant action and numerous plot twists along the way. Although you could argue that artistic licence has been used with one or two of the twists that the characters face, their reaction to these twists always come across as plausible and an accurate portrayal of how you might react in such a situation. 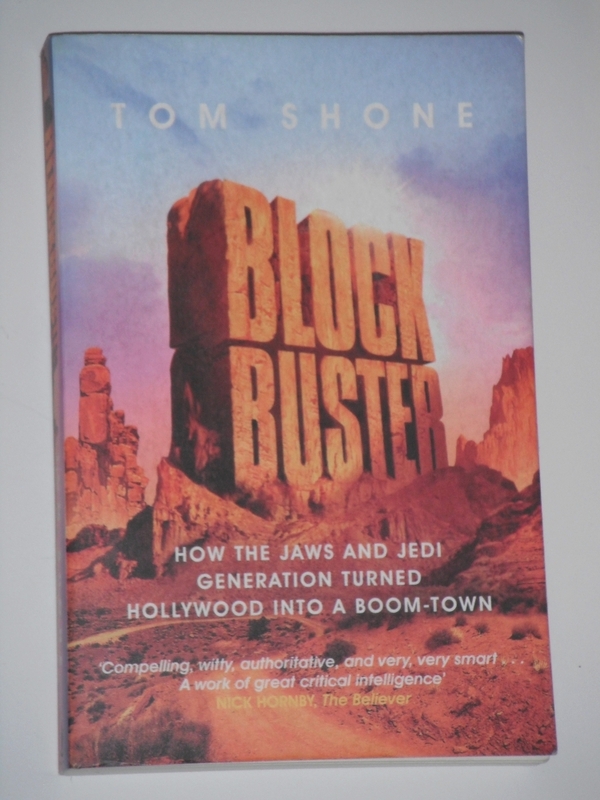 Blockbuster is a book written by a fan of blockbusters for readers who love blockbusters. From the opening few pages of Blockbuster it is clear that Tom Shone is a writer who is not afraid to celebrate success and he has obviously chosen his subject matter based on a topic which he visibly has a great deal of positive enthusiasm for. To put it simply, Blockbuster is a book written by someone who loves blockbusters for readers who love blockbusters. And that’s perhaps one of the main reasons why I enjoyed this book so much. Right from the start it becomes apparent that Tom Shone is an author who much prefers to praise some of the brilliant and memorable moments in movie history, rather than criticise the occasional failures. He is also someone who clearly takes pleasure when deserving movies are a commercial success as well as a critical success, and he doesn’t see ‘money’ as a dirty word. All in all these factors make him the perfect choice to write this book. Pride Of Baghdad: "...cleverly written and thought-provoking." 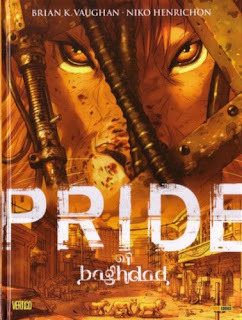 Pride Of Baghdad is inspired by the true story of a pride of lions living in Baghdad Zoo, which, during the Iraq War was partially destroyed by a bomb and thus granted the lions their opportunity for freedom. Initially hungry and confused, the lions embarked on a search for food and a struggle for their lives. As you might have already guessed writer Brian K.Vaughan cleverly uses the lions to make parallels between the war going on around them at that time and he also investigates the true meaning and price of freedom and the struggles faced in the quest for that freedom. One of the reasons why Pride Of Baghdad works so well is down to the story being told from the point of view of the animals. The lions debate their fate and their options at every step of their journey and each of the lions has been given a distinctive personality which makes for an interesting cast of characters. More people need to know about this album. reach an audience just as big as Bob Dylan's. The Wild Hunt by The Tallest Man On Earth (stage name of Kristian Matsson) is an absolutely beautiful collection of feel-good songs which every time you listen to it will remind you how powerful music can be and how strongly it can touch your emotions. Kristian Matsson’s chosen performing name of The Tallest Man On Earth should already be a clue to this, but his musical inspiration obviously owes more than a great deal to Bob Dylan (The Tallest Man On Earth being the name of a Bob Dylan song). 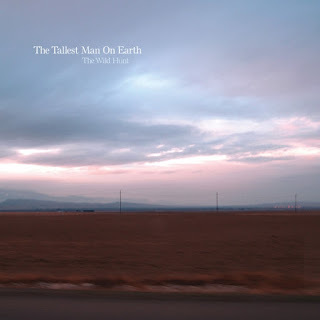 Both his vocals and his guitar playing style are clearly heavily influenced by presumably one of Kristian’s musical heroes and although this might be a controversial thing to say, in my opinion The Tallest Man On Earth and specifically The Wild Hunt deserves to reach an audience just as big as Dylan’s. I realise that’s quite a big statement to make, but I seriously can’t understand how The Tallest Man On Earth isn’t much bigger than he is. 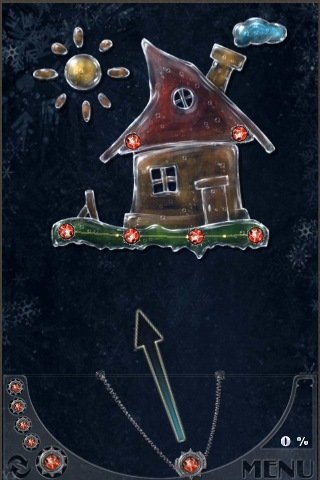 Amazing Breaker for iPod: Slick graphics and atmospheric sound effects add to the overall enjoyment of the playing experience. Amazing Breaker by Dekovir Entertainment. Like many of the most successful iPod games, Amazing Breaker by Dekovir Entertainment takes a simple idea and implements it extremely well. Each level sees you having to destroy a beautifully rendered ice sculpture with only a limited number of bombs to launch from your catapult. Destroy over ninety percent and you progress to the next level, with the exact destruction percentage also determining how many gold stars you are awarded. To earn a perfect three gold stars you have to destroy the entire ice sculpture, which on some of the later levels can be quite a challenge. That’s the basic premise behind Amazing Breaker but there are of course extra features which give the game added depth. Firstly, your bombs come in many various forms, from the most basic red coloured spike bomb which simply explodes when it makes contact with an ice sculpture, to the more versatile green coloured split bomb which splits into three separate explosive mines if you touch the screen while the bomb is in flight. Keep these mines within close enough range of each other and they stay linked together and therefore detonating one of the bombs will trigger a chain reaction detonating all of the linked mines. A similar bomb is the purple coloured helicopter bomb which allows you to place three separate mines with more precision and which again if kept within range of each other can link up for an explosive chain reaction. Svengali features Derren at his predictably unpredictable best! Derren Brown’s most recent stage tour*, Svengali, was named after an early automaton (or robot-like doll) built in 1760 by a Hungarian called Hugo Von Levascht who modelled the doll in the likeness of his own dead son. * At the time of writing. When the doll originally performed, people at the performances believed that the doll had possessed them, leaving many of them terrified. This was a belief that Levascht himself encouraged and in fact people became so convinced by the powers of Levascht’s act that at one stage the Catholic church actually exorcised the Svengali doll. As you can imagine this is just the type of back-story which would appeal to Derren Brown and so when an anonymous bidder bought the doll at an auction a few years ago it should come as no surprise to work out who that mystery bidder might have been.